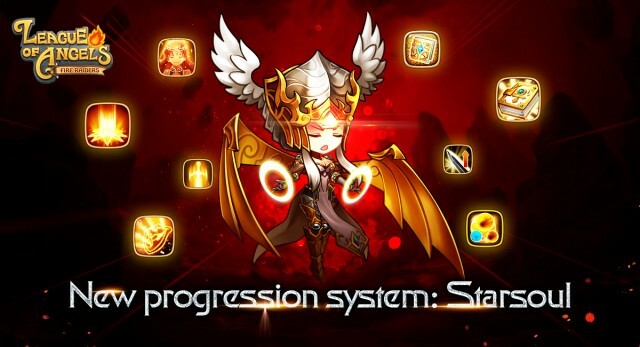 League of Angels – Fire Raiders Update 4.0 Released New Heroes, New Progression and More! League of Angels - Fire Raiders just released its new update adding new Heroes, new progression and more improvements to the game! The update is available from Google Play, the App Store and Amazon. Download now and experience all the brand new content for the best free to play strategy RPG on mobile! Sorceress: Sorceress is an unusual magician whose power comes from a different source than other magicians in Elysium. Studying magic from an early age, she has focused her efforts into condensing magic into materials. After countless failures, she was finally successful in bringing some of her eccentric ideas to reality. Her magic equipment enables her to release lethal spells in a flash. Seraphina: Seraphina is a warrior with a very strong sense of justice. She is extremely proud of her two golden wings, which she claims to have been blessed by a sacred altar during one of her adventures. The blessing grants the wings not only a glamorous look, but also immense power that can even defy death. It does not matter if she truly gained the power from an altar, it only matters that she has decided to use the power to uphold justice and peace in Elysium. Melody: Like Holy Keeper, Melody comes from the Angel City of Lordran. It is a both populous and popular city because the hot weather there does not allow the priestesses-in-training to wear much cloth. A little different to what Holy Keeper studied during magic school, Melody devoted herself to the power of music and healing. Her sweet voice can mend even the most grievous wounds. Frost Heiress: Frost Heiress is the Heiress of the northern Ice Citadel. She uses her trusty bow to pierce enemies with arrows of ice and always fights with her loyal companion - a massive polar warbear. As the heiress of Ice Citadel, she commands absolute respect from others, especially from women. Medusa: She is one of the most mysterious assassins in Elysium. No one that has seen her true face has lived to tell about it. It is said that she is the offspring of the Queen of the Gorgons. Now she has decided to emerge from the night and show the demons what true terror is. Starsoul is unlocked for a Hero at Epic or higher quality. Each Hero has 2 Starsoul paths and players may choose to upgrade 1 path. Each Starsoul is unlocked when the previous one is upgraded to a specific level, unlocking and upgrading Starsouls require Starsoul Gems. Each Hero has 1 free complete Starsoul reset, and then further resets will cost Diamonds. Starsoul Gems can be obtained from the Tyrant's Lair Shop.